Fun at the Lincoln Park Zoo! On a recent visit to Chicago along with my friend Linda we visited the Lincoln Park Zoo. It was surreal viewing the farm portion of the zoo with barns in the forefront and sky scrapers in the background. The visit was on a clear April day and as a grandma I was eyeing the exhibits thinking how much my grandchildren would enjoy this 35-acre zoo that was founded in 1868, making it one of the oldest zoos in the nation. Meandering through the paths we had a few favorite stops that included the playful Malayan Sun bear who was lying on his back and enjoying a snack. The bear was so cute he looked like a stuffed toy until we spied his claws that were several inches long, quickly dispelling the notion that he would be cuddly in any way shape or form. Another beautiful stop was at the Kovler Lion House that was built in 1912. We saw a quick glimpse of a snow leopard and a fleeting view of a big cat that was so quick that all the pictures I took were just blurs of motion. 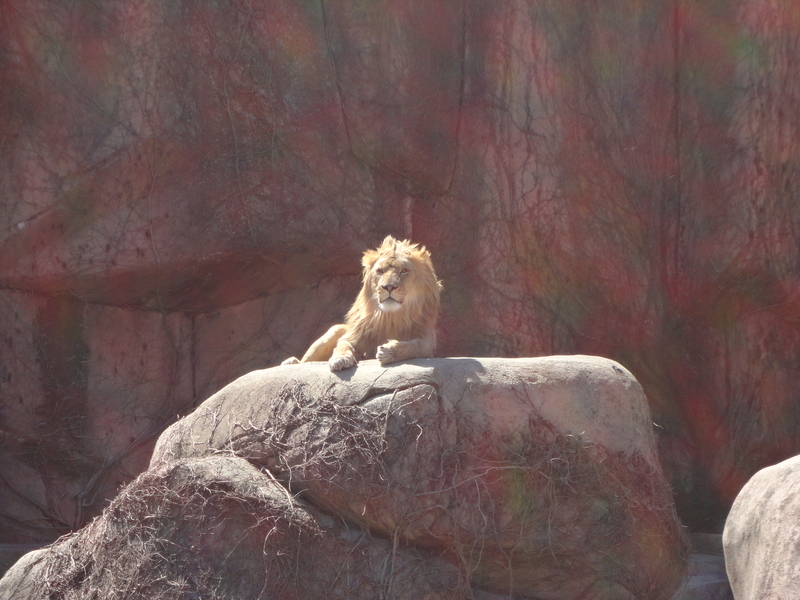 We were able to view though the majestic African lions both a male and female sunning. The male lions which can weigh up to 500 pounds were sitting on a rock watching the visitors with disdain that came and snapped pictures of the majestic King of the Jungle. Part of the enjoyment was the beauty of the day, the violets and daffodils in view and of course a morning with a good friend! For details, log onto http://www.lpzoo.org/plan-your-visit for details. Previous Post: High Tea, an enjoyable English Tradition!